WARM WEEKEND AHEAD: The sky has become partly sunny across most of Alabama this afternoon; temperatures are rising into the 70s. But a band of thunderstorms continues over far south Alabama and the Gulf Coast. Saturday will be a warm day with a mix of sun and clouds; the high will be in the 77- to 80-degree range. A few scattered storms will likely form, but a decent part of the day will be dry. Where storms do form they could be strong, with gusty winds and possibly some small hail. The Storm Prediction Center has introduced a low-end marginal risk (level 1 out of 5) of severe storms for much of the state on Saturday. Don’t look for much change Sunday. It will be partly sunny and warm with a high at or just above 80 for most spots, and the potential for a shower or storm in a few spots. Most of the day will be dry. Then, thunderstorms become more numerous Sunday night with the approach of an upper trough. 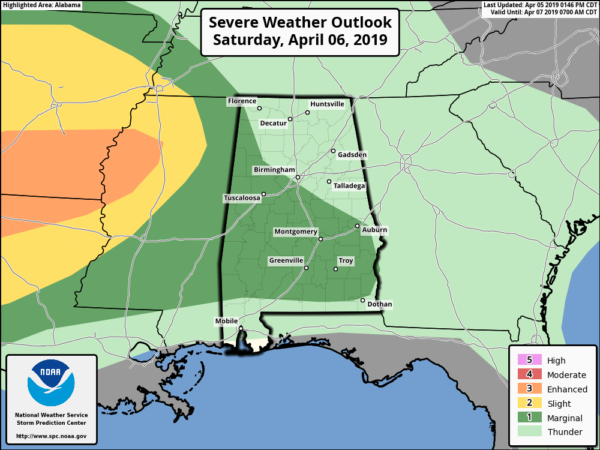 The SPC has defined a slight risk (level 2 out of 5) of severe storms for areas west of a line from Huntsville to Warrior to Linden to Millry. 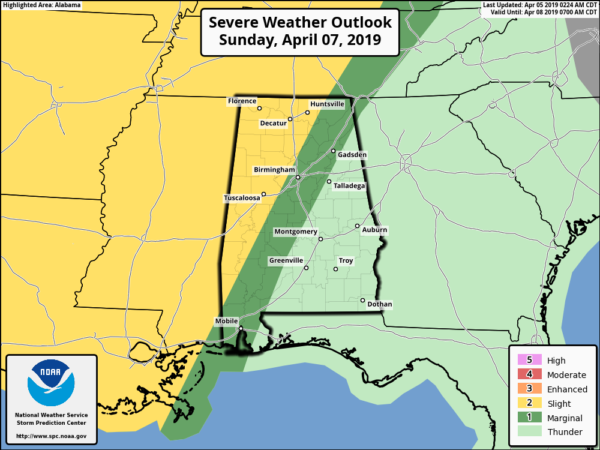 A marginal risk (level 1 of 5) extends as far east as Sand Rock, Sylacauga and Monroeville. Showers and storms are likely Sunday night and Monday; the main threat for now seems to be strong straight-line winds and hail. Rain amounts of 1 to 2 inches are expected. THE REST OF NEXT WEEK: A few lingering showers are possible Tuesday over north Alabama with a mostly cloudy sky, but for now the rest of the week looks dry with warm afternoons and pleasant nights. ON THIS DATE IN 1936: A violent tornado moved through Tupelo, Mississippi, killing 216 — the fourth-deadliest tornado in United States history. Making its way toward Tupelo, the massive tornado killed a family of 13 as their house was swept away, and injured many more before reaching Tupelo’s west side. Retroactively rated EF-5 on the modern Enhanced Fujita scale, it caused total destruction along its path through the Willis Heights neighborhood. Dozens of large and well-built mansions were swept completely away in this area. Although missing the business district, the tornado moved through the residential areas of north Tupelo, destroying many homes and killing whole families. The Gum Pond area of Tupelo was the worst hit. Homes along the pond were swept into the water with their victims. The majority of the bodies were found in Gum Pond, the area which is now Gumtree Park. Among the survivors were 1-year-old Elvis Presley and his mother, Gladys. His father, Vernon, was out of town looking for work at that time.